by Devendra Damle and Shubho Roy. The Directorate General of Civil Aviation (DGCA) recently released draft guidelines for regulating civilian drones, for public comments. Clause 12.21.e) of the guidelines establishes a no-fly zone in all areas within 50 km of India's land border. In this article we try to estimate the footprint of this clause on the economic activity in these areas and on the residents. The drone guidelines are a type of delegated-legislation (regulations are another). The legislature of a modern economy is usually neither equipped, nor has the time to legislate all details of a law. Therefore, the legislature usually creates the broad legal framework, and the authority to fill in the details is delegated to the executive or statutory bodies (like regulators). Since government agencies, unlike legislators, are not elected representatives of the people. Therefore, the regulations/guidelines made by such agencies are not strictly democratic. To address this democratic deficit, legislatures place certain requirements on government agencies making regulations. Two common requirements are to (i) invite public comments on draft regulations, and (ii) conduct a Cost-Benefit Analysis (CBA). The agency is required to estimate the costs of complying with the regulations, and the benefits arising out of the regulations. Neither inviting public comments nor conducting CBAs is a universal requirement in India. The DGCA, should be commended for inviting public comments on the draft regulations. It has, however, not conducted a CBA of the regulations. A CBA can sharpen the decision making of a government agency. Even before public consultation is done, a CBA provides the government agency an idea of potential costs and benefits. Consider the way the New Zealand government did a CBA for a proposed regulation on drones. It gave five options for regulation (including ban) and analysed the impact of each one of them. The impact of each option was then measured against the stated objective of the regulation. Another example is the US Federal Aviation Authority's (FAA) proposed regulation on training and licensing of drones. Even on this narrow point the FAA carried out a detailed analysis of the total costs and benefits to society. On the side of costs, the FAA estimates that each pilot will have to spend USD 150 to be trained. This training is expected to result in social benefits of USD 733 million (pessimistic estimate) to USD 9 billion (optimistic estimate) over five years. The FAA provides detailed information about assumptions and methodology for interested parties to do their own calculations. In this article we try to analyse the impact of one provision of the regulations: the no-fly zone. Such analyses can be used in a CBA of drone regulations. It is difficult to predict the impact of any new technology. Before the Internet, mobile phones or GPS became ubiquitous it would have been impossible to predict all the innovative ways they would change human life. Similarly, drones are a disruptive innovation that may have a profound impact on us. To estimate the impact of 12.21.e), we examine three sectors in which drones are already changing established processes or hold great promise to do so: (1) general services to the population, (2) agriculture, and (3) infrastructure monitoring. General services to the population: Drones will change the way goods and services are delivered to the masses. They might be especially effective in border areas which typically suffer from low connectivity. For example, Zipline, a private company that uses drones to deliver blood to hospitals in the mountainous region of Rwanda, has cut down the delivery-time from 4 hours to 45 minutes. Facebook plans to use drones to provide internet connectivity in remote areas. In urban areas, drones can be used for governance. In Gurgaon, for example, drones are being used to conduct land-use surveys, for assessing property tax, checking encroachments, and urban planning. In the private sector, drone have multiple applications which go beyond the obvious courier and delivery services. For example, private construction companies can use them to monitor construction and maintain a safe working environment. Drone photography and videography are a new source of economic activity, which will be denied to people living in border areas. Agriculture: Many Indians still derive their income from agriculture and drone technology is already changing agriculture in India. In Karnataka and Haryana, drones are going to be deployed for spraying pesticides on crops. Drones can identify plant disease before any visible signs show and alert farmers or spray crops with appropriate pesticides. In Gujarat, Maharashtra, Rajasthan and Madhya Pradesh insurance companies are using drones for quick assessment of crop damage for crop-insurance payouts. Infrastructure: Drones can be used for inspection and monitoring of infrastructure projects. The Prime Minister, Narendra Modi, recently suggested using drones to monitor rural road construction projects and to keep illegal mining in check. Power companies are using drones to monitor power lines in remote and inaccessible areas. Similarly, the Gas Authority of India Ltd. is using drones to inspect sections of gas pipelines that pass through difficult terrain. The no-fly zone effectively bans this kind of drone usage in the border districts, many of which have difficult terrain. Our approach to measuring the impact was mapping the 50 km no-fly zone using geo-spatial analysis, and then, estimating how many people, how many urban areas, and how much land, agricultural area and infrastructure are situated in the zone. We split the districts into three categories, based on the percentage area of the district covered by the no-fly zone as: X, Y & Z. Category X districts are those where the no-fly zone covers less than 50% of the land area. For Category Y districts, the coverage is between 50–90%. Category Z are districts where the coverage is more than 90%. For the pessimistic estimates, we assume that the percentage of the population, agricultural workers, agricultural area, and operational land holdings falling in the no-fly zone are the same as the percentage of the district's land area covered by it. For example, if the no-fly zone covers 40% of a district's land area, then we assume that 40% of its total population, agricultural area, and operational land holdings lie in the no-fly zone. For the realistic estimates, we halve the pessimistic estimates for all Category X districts. For Category Y and Z districts we take the same values as the pessimistic estimate. For the optimistic scenario, we use a scheme similar to the realistic estimate, but we halve the pessimistic estimates for Category X and Category Y districts. For Category Z districts we use the same value as the pessimistic estimates. ESRI's A-16 Federally Derived Data, Open Data Catalogue — for shape-files of Line of Control and Line of Actual Control. The number of districts has increased since 2011, from 640 to the current number of 707. We have considered the population, number of districts, and district boundaries as given in the 2011 Census. To demarcate all areas in India within 50 km from the land border (and from the LoC, LAC and AGPL in Jammu and Kashmir), we plotted a 50 km inward buffer. This represents the no-fly zone. We calculated the area of overlap between the no-fly zone and each district, to calculate what percentage of the district's land area is inside the no-fly zone. To estimate the population, number of farmers, agricultural area, and operational land holdings in the no-fly zone, we multiplied the respective totals for the district by the percentage of the district's land area lying within the no-fly zone, along with the applicable discounts. We used the previously plotted no-fly zone as a filter, to extract urban areas (cities and towns), canals, roads, railway stations and bridges falling in the no-fly zone from the Open Street Maps data dump for all of India (downloaded on 17/12/2017). The operation is analogous to using a cookie-cutter to cut out a shape from a flat piece of dough. Here is the data (geo-spatial and tables) to reproduce the results. The following figure shows the total area of India covered under the 50km no-fly zone. More than a quarter of India's districts (168 out of 640) across 18 states fall at least partially within the 50 km no-fly zone. In more than 10% of India's districts (65 out of 640) the no-fly zone covers more than 90% of their land area. Of these, 39 districts fall completely inside the no-fly zone. Table 1 shows the population, number of farmers, land area, and agricultural land covered by the no-fly zone. As Table 1 shows, 8–10% of the total population of India will be affected by the no-fly zone. It will impact between 6–9% of all the farmers in India. The total affected population in the pessimistic scenario (141.27 million), is greater than the total population of the 75 largest cities in India put together (140.33 million). Jammu & Kashmir (20 out of 23), and Assam (20 out of 27) have the highest number of affected districts followed by Uttar Pradesh (15 out of 71) and Bihar (14 out of 38). In terms of percentage of total number of districts affected, Mizoram, Sikkim, Tripura are at the top, at 100%. This means that every single district in these states is at least partially by the no-fly zone. These three states are followed by Jammu & Kashmir (91%), Manipur (89%), and Meghalaya (86%). In terms of percentage of total land area covered, the ban disproportionately affects the northeastern states. Sikkim and Tripura are entirely covered by the no-fly zone. The no-fly zone covers 86% of the land area in Mizoram, more than 60% in Manipur, Arunachal Pradesh and Meghalaya, and more than 50% in Nagaland. These are all small states, which one would expect to have high coverage, but some of the larger states are also heavily affected. 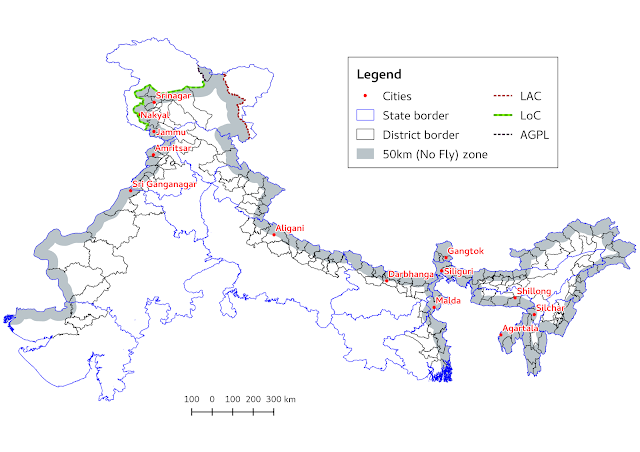 The no-fly zone covers nearly 44% of the total area of West Bengal, nearly 39% of Bihar, and nearly 33% of Punjab. While a large chunk of the population affected by the no-fly zone will be from rural areas and small towns, some large cities will be affected as well. Table 2 gives an overview of the infrastructure and urban areas located inside the 50 km no-fly zone. As Table 2 shows, a total of 13 cities fall in the no-fly zone. Of these, four are state capitals. Amritsar and Jammu are among the other major cities that fall inside the no-fly zone. A significant amount of infrastructure also lies in it. With such large areas affected by the proposed ban, it becomes necessary to ponder the costs and benefits of such a blanket ban. These draft regulations will exclude a substantial part of India's population from the benefits of drone technology. An example of a similar blanket ban, based solely on geography, is the Ministry of Defence's map restriction policy of 1967 (revised in 2017). It restricts the sale of high-resolution topographical maps of all border areas to civilians. The restricted zone covers all areas within approximately 80 km of the border, which is nearly 40% of India's total land area. This ban, like the drone ban, was also enacted due to national security considerations. However, with the advent of satellite imaging technology, the same maps are easily available from international vendors. This means the ban is not only redundant, but has also resulted in lost revenue for the Government of India. It also means that foreign nationals have easier access to high-resolution topographical maps of restricted areas in India than agricultural cooperatives, gram panchayats, municipal bodies, companies and Indian citizens residing in these areas. For the government, a blanket ban seems attractive because it (apparently) requires the least amount of state capacity to enforce. In the case of the no-fly zone, all the government has to do is penalise any person flying drones in the no-fly zone. It does not have to determine whether the drone use was legitimate or not. The government also does not have to invest in setting up offices and systems to license and monitor use. However, blanket bans are also the most expensive form of regulatory intervention. They do not distinguish between legitimate and illegitimate activity, and treat both the same way. In doing so blanket bans impose huge costs on those they regulate. India's economic history is peppered with instances where blanket bans were imposed, only to later realise they were hampering economic development. Banning entry of foreign investors, financial derivatives, and private participation in banking and insurance are a few notable examples. Thankfully, the country has begun to undo them gradually, but the damage has already been done. In some cases, India has not taken the ban approach. India did not ban mobile phones and internet near the border. Instead, in many border areas, the government has worked harder to provide last-mile internet and mobile connectivity. While mobile phones and internet also pose national security concerns, the country did not choose to go down the banning route for them. Similarly, for drones, we might need a more nuanced approach to regulation that tries to balance national security with the legitimate needs of residents in the no-fly zone. For example, even today, farmers in Punjab are allowed to grow crops in no-mans-land, beyond the border fence with Pakistan. The security concerns there are addressed by security checks rather than a complete ban on farming. Farmers in 10 districts of Punjab (situated well away from the same border) will be unable to use drones for agriculture. In Punjab, a state which already suffers from overuse of pesticides, drones can decrease their use by only spraying affected crops. The security concerns, like in the case of farming in no-mans land, can be met with monitored use. The blanket ban also ignores India's border policy. 33 districts (in Uttarakhand, U.P, Bihar and Sikkim), which lie in the no-fly zone, are on or near the border with Nepal (but not China). Similarly, 12 districts in Assam which are in the no-fly zone are on or near the border with Bhutan (but not China or Bangladesh). India has good relations and an open border policy with both these are nations. Using the same standard (i.e. blanket ban) as the one used for districts on "sensitive borders" is a disproportionate response. It demonstrates a lack of risk-based regulatory approach. The ban, as it stands is inequitable. It disproportionately affects states sharing a land border with other countries, especially the north-eastern states. If drone technology starts impacting quality of life, persons in the no-fly zone may be deprived of economic opportunities. Such a deprivation is worse when it is done through regulation. Since a regulation is issued by an un-elected government agency; it denies Indians in the no-fly zone their right to participate in the legislative process. India needs a regulatory framework for drones. The advent of any new, disruptive technology creates tension between the freedom of people (to use to it, to improve their lives) and national-security concerns. Building state capacity is hard, and building it close to borders is harder. However, bans cannot be a substitute for it. In the case of civilian drones in border areas, closer monitoring, cooperation with border forces, involvement of local authorities, and higher security clearances are some alternative approaches that could better balance the tension. Our drone regulations need to create this balance. India needs drones by Shefali Malhotra and Shubho Roy, Ajay Shah's Blog (June 2016). A cost-benefit analysis of Aadhaar, National Institute of Public Finance and Policy (November 2012). The authors are researchers at the National Institute of Public Finance and Policy, New Delhi. We thank Shekhar Harikumar for valuable inputs.